Roman Díaz is a master percussionist from Havana, where he was trained by elders in the fine arts of classic Afro-Cuban musical traditions. In the USA, he organized a performance ensemble called "Omi Odara," a Lukumi phrase meaning "pure water," or "water that blesses," because "there is nothing more pure than water." They perform ritual Santeria, Abakua, and Palo Monte music, as well as continue the rumba and Son lineages of Arsenio Rodriguez, Chano Pozo, and Ignacio Pineiro's Septeto Nacional, all of whom drew upon Cuba's African heritage in their music. Contrary to the typical use of these traditions as "spice" for "world music", Diaz's ensemble is distinguished for respecting these traditions through artful and passionate performances based on deep ritual knowledge. They entertain while they educate. 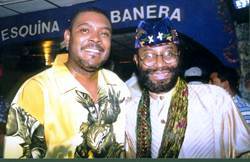 In the summer of 2001, Diaz and other Cuban Abakua met Efik Ekpe member Asuquo Ukpong at the Esquina Habanera in New Jersey; soon afterwards they performed at the Efik National Association meeting in New York, where they introduced the assembled Efiks to their cousins in Cuba. La Rumba del dia 14 de Octubre se traslado para el Domingo 15 de Octubre a las 5:00 pm y se mantiene la Rumba del dia 28 de Octubre , 2006 a las 7:00 pm. *Grupo folklorico "Orikí Omi Oddará"
2002 - April 19, Amherst College. A lecture / performance by Dr. Ivor Miller, Copeland Fellow at Amherst College, accompanied by Omí Odara, a five member performance troupe directed by Roman Díaz, former member of the Cuban rumba group Yoruba Andabo, who was selected as a Latin Percussion representative in 2002. Mr. Díaz is a high level member of the Abakua society, and a distinguished member of the sacred bata drum guild, Añá. 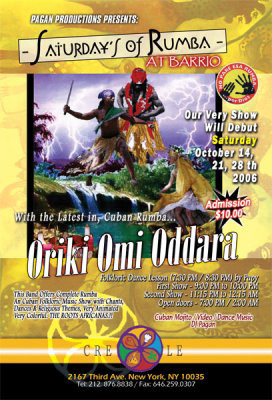 Omí Odara performed Ireme masquerade dances and related chants, originating in Calabar, Nigeria and recreated in 19th century Cuba, where they are integral to ceremony of the Abakua society. Three Afro-Cuban percussionists pounded rhythms on hand drums, singing in African languages as the dancer, through gestures and movements, told ancient stories of secret societies, Yoruba kings, and Kongo spirits. This isn't a report from Havana; it happened in a DePaul University conference room right here in Chicago. 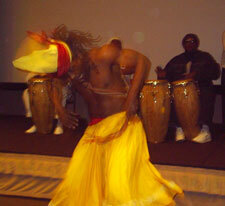 "Recreating Africa in the Americas Through Rhythms and Rituals" was not a typical conference. Combining performance and scholarly research, the two-day event, sponsored by DePaul University's Center for Black Diaspora earlier this spring, investigated the rich African cultural heritage that miraculously survived four centuries of the Transatlantic Slave Trade. Scholars from around the world presented research on the African-derived music, dance, religions, and languages of countries including Cuba, Haiti, Jamaica, and Brazil. But the highlight was undoubtedly between the presentations, when Omi Odara, a New York-based troupe specializing in Afro-Cuban music and dance, gave attendees a rare look at some of the musical expressions that are at the root of much of today's Afro-Caribbean and Latin jazz music. Led by master drummer Román Diaz, the group began with ritual a cappella singing that recounted the myths of Abakuá, a secret male society in Cuba that originates from Nigeria's Cross River region. Later, Omi Odara played complex, interlocking rhythms on four sacred drums during the masquerade procession of the ireme dancer, a spectacle rarely seen outside Cuba or Nigeria. The music of Santeria, the Afro-Cuban religion rooted in the Yoruba culture, opened the second day. Dancer Félix "Pupi" Insua performed as several of the orichas (deities representing forces of nature) including Elegua, the Trickster. As he feverishly danced around the conference room to the intense call-and-response singing and drumming of the group, Elegua urged attendees to get up and move, and in seconds virtually the entire room was grooving with the Guardian of the Crossroads. 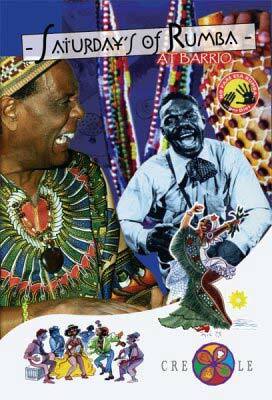 The powerful music of the Kongo-Cuban religion Palo Monte concluded the unforgettable performance of Omi Odara. Insua greeted and danced with audience members as he called out to the ancestral spirits in a mixture of the Kikongo and Spanish languages. The free event, organized to celebrate the inaugural year of the African and Black Diaspora Studies Program, was the first of its kind at DePaul. Attendees included leaders from the various African, Caribbean, and American communities represented in the program, said Dr. Ivor Miller, the DePaul professor who organized the event. "Too often academic discussions of the African ethnic Diasporas in the Americas are abstract and based on published sources—much of it created by European observers complicit in the dynamics of the Transatlantic Slave Trade," Miller said. "By actually seeing representatives of West African and Cuban African-derived traditions perform their music, dance, and chants, the issues at hand become much more accessible." After the conference, Omi Odara members headed to Rhythm nightclub for an impromptu rumba with conga drumming that surely must have pleased Changó, the oricha of thunder who loves to dance. Omi Odara performs the music of Palo Monte. Photo by Omar Torres.